I had a man who was working at the Taste of Chicago's Chicago Tribune booth tell me that no matter what I know now it's going to be a long haul to the top of the sports journalism world. Dare I say that trip is a bit shorter now? From Tuesday's Dan Patrick Radio Show (where he's interviewing FOX Sports' Ken Rosenthal on who will or will not be traded. Ken: No. He's under contract until '09 and no one's going to pay Billy Beane's price. 5:54 Central Time. Cubs acquire Rich Harden. Oops! 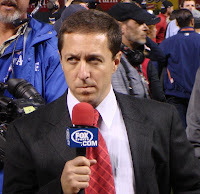 Mr. Rosenthal, Peter Gammons you are not! So...um...ready to move me up the sports reporter food chain yet?